This summer is all about fun! Take a break from your to-do list and the never-ending list of projects around the house/office to organize the best summer barbeque of the year. 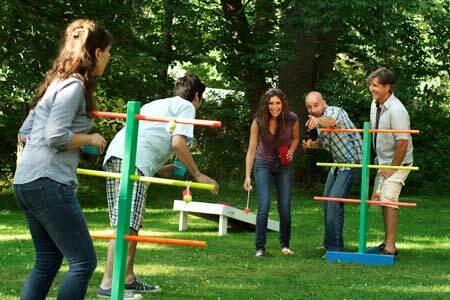 Include fun lawn games and good food that will last ‘till the sun goes down. For those of you who still have winter weather then take note and plan for that beautiful sunny day. How to Catch Fireflies: Find an old jar and punch holes in the lit, add some grass and a piece of fruit. One night at dusk, search for bugs with your kids. The bugs move slowly so they are easy to catch. Males fly around while females sit in trees, in shrubs, or on the ground. So find a female and watch her blinking pattern. Then imitate the pattern with a pen flashlight and the males will come to you. How to Stargaze With Style: To stargaze with the essentials you will need to download and print the chart. (“Interactive Sky Chart”) skyandtelescope.com. Find a spot were street lights will not bother your stargazing. The desert is the best place, but if you can’t make it there, a mountain or small hill will suffice. The planets are visible in the early evening; Venus will be in the western horizon right after sunset and Jupiter is second brightest in the sky toward the south. How to Play The Best Grass Games: The best summer grass games for your summer BBQ are croquet, cronhole and frisbee golf to name a few. These easy games can be played with little or no cost to you. How To Tell the Best Ghost Stories: The Best ghost stories include a hideous crime with an unsolved murder that takes place where ever you are. Always include a creepy name that reflects on something easy to imitate and come to life. (Like the Whistling Man or the Camp Ground Creeper.) Use another adult to make sounds to go with your scary story. How to Eat Ice Cream Without A Drip: Start off ordering a vanilla-based ice cream because it generally melts slower then chocolate-based ice cream. Get a cake cone or waffle cone to keep the drips off your shirt by gently pushing the ice cream back into cone with tongue. If you want a sugar cone just ask for a cup and turn it upside down in the cup. This saves the ice cream for your mouth and not your shirt. What is your favorite “organizing a summer BBQ” tip?